TEDxHimi is run by volunteer staff. Our first event “Passively Active” held on the 24th January, 2016 was a huge success thanks to the support of the volunteer staff. Volunteers are divided into separate teams and work together with other members of their respective group under the direction of a team leader. TEDxHimi would not be possible without the staff; the people working earnestly behind the scenes to support what is seen front of house. We would therefore like to publish a series of posts casting the spot light on the volunteers behind TEDxHimi. 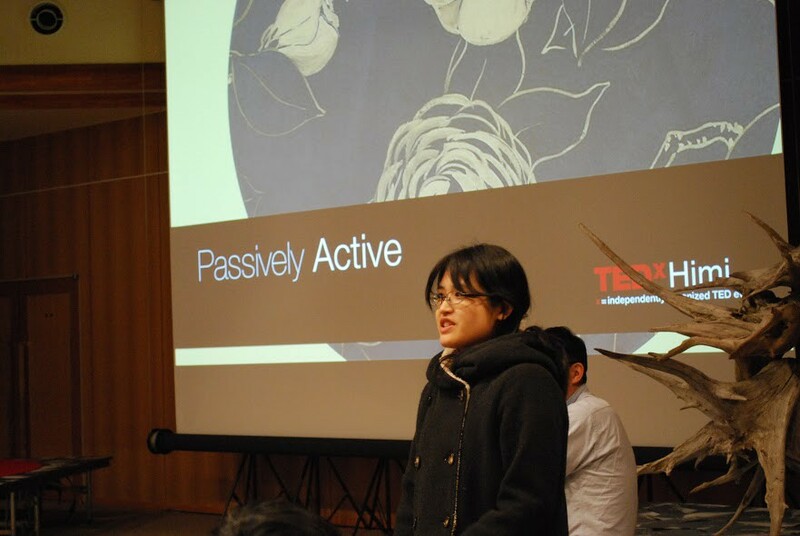 First, allow us to introduce the TEDxHimi Volunteer Coordinator, Ms. Miyabayashi. Hi, I’m Tomoko Miyabayashi, and I’m responsible for volunteer coordination. My job includes getting in contact with staff, managing distribution of personnel on the day of the event, along with directing staff and participants around the reception area. Held in January of this year, TEDxHimi was the first TEDx event to be held on the coast of the Sea of Japan. I got involved in this event because my friend invited me. At first, I no idea what I was supposed to do, or even what I could bring to the event. In all honestly, the idea of hosting a TEDx event in Himi felt somewhat surreal. However, meeting by meeting, day by day, TEDxHimi became more and more of a reality to me and I soon came to realize that the success of this event depends on the hard work of every single staff member. An event this scale could have never been accomplished alone. However, through the combined efforts and strengths of many, different people, TEDxHimi was a tremendous success. Being the Volunteer Coordinator, I particularly felt the significance of each of the volunteers who helped to run this event. We are currently getting ready to host the second TEDxHimi event scheduled to be held next year. There were many points from the first TEDxHimi event which need reflection. I hope to utilize the experiences gained during the first event to ensure that all volunteers feel glad for taking part in TEDxHimi. I imagine there may be some of you out there who may feel a similar sense of uncertainty that I felt during the beginning of last year’s event. However, I will support all volunteers wishing to be involved. Recently, we have had some new members becoming part of our team. Unfortunately however, we are still in need of many more volunteers. For those of you considering joining TEDxHimi, please come along to our next meeting. The TEDxHimi team would love to support you in any way possible, so please do not hesitate to ask us questions!